On April 14, 2018, the world stopped. Or it sure felt like it, because that was the day we witnessed the jaw-dropping Coachella performance from none other than Beyoncé. That year’s festival was rightfully dubbed Beychella afterwards, and left little doubt about who really runs the world. 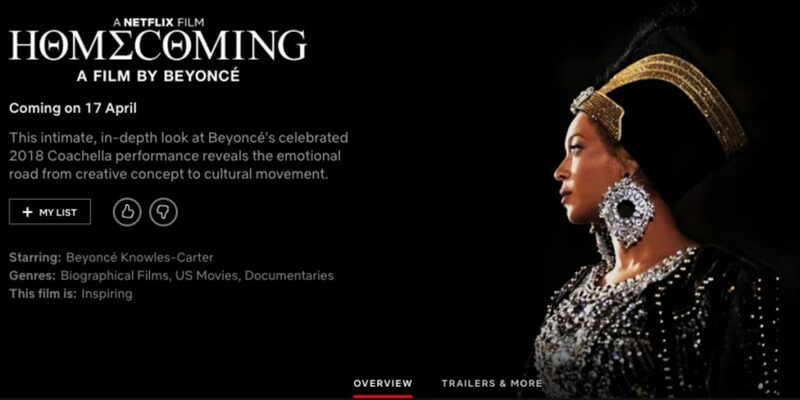 For the upcoming one-year anniversary of Beychella, Netflix and Beyoncé are taking fans behind the scenes of her incredible set in a new Netflix Original documentary, Homecoming: A Film by Beyoncé. A homepage preview of “Homecoming” on Netflix. Image source: Netflix. But halfway through the trailer, Blue Ivy takes the spotlight. She joins her mother’s dance rehearsal and flips her hair to perfection. A few blink-and-you’ll-miss it clips of Rumi and Sir Carter and JAY-Z promise a very rare and intimate look into Beyoncé’s personal life. Beyoncé’s Beychella performance was inspired by HBCUs, from the marching bands and majorettes to the Greek letters worked onto the costumes she and her dancers wore throughout the show. The iconic performance also included a Destiny’s Child reunion and appearances from JAY-Z, J Balvin, and Solange. Homecoming will be released on April 17 on the streaming service. This story first appeared on ELLE.com.